In an exclusive interview with ‘La Fiamma’, Italian Consul General in Queensland and the Northern Territory Salvatore Napolitano said that “developing a united community” is at the core of his vision for Italo-Australians. “There are so many Italians in Queensland and the Northern Territory,” Napolitano said. “There are people who came here a long time ago, who gained an outstanding reputation as hard workers, a reputation built up by the early Italians and their descendents. “And there are also many young people here speaking Italian. “Everywhere I go in the streets I hear it! “I think to myself: ‘I know this language’. “I would like to connect the old component with the young. Central to Napolitano’s plans for 2019 is Brisbane highlight la Settimana del Vivere all’Italiana, a week proposed by Ambassador Stefano Gatti and planned in collaboration with the Ministry for Foreign Affairs in Canberra. The week aims to promote Italian culture and gastronomy within the community. Also in store is la Festa della Repubblica, held on June 2, and la Settimana della Lingua Italiana, set to be held in October. Napolitano specified his intention to promote Italian universities in Australia, as a means of increasing international cooperation. He also hopes to encourage greater connection between the Australian territories. Napolitano will continue to work alongside Com.It.Es., the official body which represents Italian people abroad, and indicated that updates and expansion of the consular venue should be expected, which will improve efficiency in providing consular services. Although the new Consul’s plans prioritise la rete, that is, the Italian community network, he emphasised the importance in maintaining a close network with all members of the community, not just Italians, with the main goal being to “unite all resources for a common good”. As an example, Napolitano mentioned the recent Townsville floods, congratulating state authorities on their on-going work in preventing and managing a severe situation. 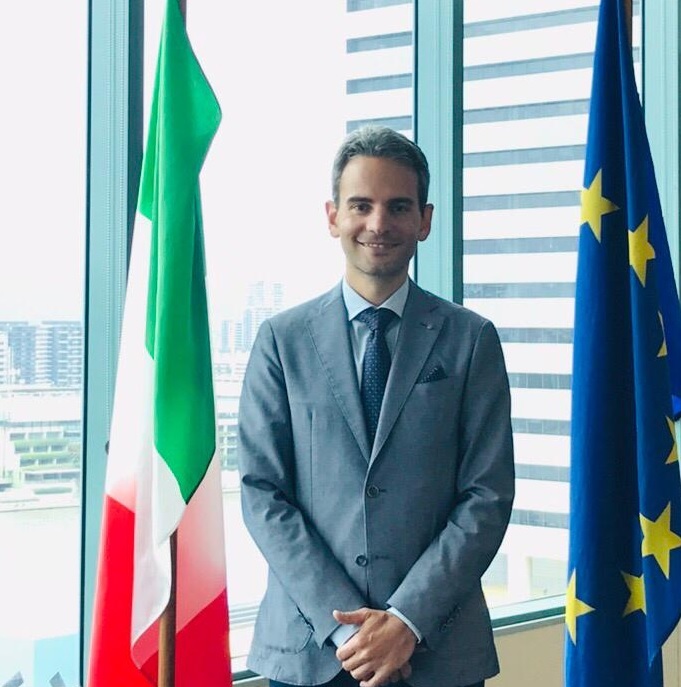 Napolitano succeeded Ludovico Carlo Camussi as the Consul representing Italy in Queensland and the Northern Territory on January 7, 2019. A law graduate from Naples, he shifted into the diplomacy sector after a string of international jobs, including for a private company in Hungary, where he met his wife, and as a civil servant with an NGO in Ecuador. In this government-funded role, Napolitano assisted migrants arriving from Colombia into Ecuador as a result of Colombian conflicts and displacement issues resulting from that. “The role was very interesting,” he said. Napolitano went on to take a position at the Italian Embassy in Buenos Aires, Argentina in 2014, which he held up until this year. He thanked extensively the preceding Consul for his hard work and dedication to the Italian community across the regions, which facilitated his smooth entrance into the position. He said that working in international affairs comes with its challenges (a Consul must relocate every four years) and it requires some personal sacrifice. Overall, however, efforts in diplomacy are always repaid. He emphasised that it’s due in large part to the Italian communities within which he finds himself. “The challenges are reduced by the big Italian communities I find,” Napolitano said. “I already feel really at home, here in Brisbane. “I must also thank all the personnel of the Consulate here, for their hard work and commitment. I would like to bring all the resources together, to make a united community.